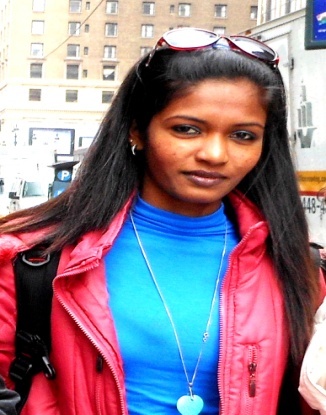 Rajini Sureka Wijerupa is from the National Office YWCA of Sri Lanka. Rajini is the World YWCA 2013 Short term intern advocating at the Commission on Population and Development 46th Session in New York, USA. I work at the YWCA of Sri Lanka as a youth coordinator and the youth coordinator of our young women lead change project. I have been involved in the YWCA for the past 13 years and I have been inspired by the vision and the strategic frame work of the World YWCA which empowers the young women throughout the world, especially the excluded communities. YWCA of Sri Lanka shares the same vision and goals. As the youth coordinator of the association I would like to contribute to the implementation of strategies that empower young women within the YWCA in my country and the society outside the association. I have experience coordinating 160 youth of YWCA Association nationally including 72 youth of Peer Leaders. I really want to extend my gratitude of thanks to the World YWCA office for giving me such amazing opportunity to be one of the short interns for this year this.The World YWCA has been at the forefront of young women’s empowerment, continually advocating for young women becoming leaders both within and outside the YWCA movement, building their confidence and encouraging peer training, mentoring and sharing of experience. Through internships, leadership training, dedicated space at the decision-making table; and opportunities to engage in global and regional advocacy, the World YWCA equips young women with the knowledge, skills and experience. The Commission on Population and Development (CPD) has been a tremendous experience since it was my first time to attend CPD and also my first time to visit New York. As a group we are advocating for the following key priorities as identified in the Global World YWCA Strategy on Sexual Reproductive Health and Rights (SRHR), and which are complimentary to the key priorities identified in this year’s CPD session which focuses on migrants and their access to services. This was a great experience for me that has developed my knowledge and understanding in the global context of SRHR. This will improve my future work on the SRHR Programme activities in the YWCA of Sri Lanka. I look forward to making a difference this week at the 46th Session of CPD.